There are many things about teaching that can be described, but some very important things can be very difficult to measure. This group is working on creating an infrastructure and set of methods to make quantitative claims about phenomena in teaching, such as teacher decisions, recognition of norms and obligations mathematical knowledge for teaching, and teacher beliefs. Developing these methods should help get the field beyond "what works" to a place of "how things work," ideally resulting in a model where we can better justify certain teaching practices and predict the results of their use. In addition to exploring interventions in classrooms, or working with teachers watching videos of classrooms, the group is using LessonSketch, a cartoon-like technology that allows users to quickly create and/or watch classroom scenarios. There are several aspects to this research. First is looking at the breaching of norms. Using LessonSketch, teachers watched animations of classroom practice and "pinned" instances of norms being breached. The group found that participants were more likely to pin and remark on actions that breached norms, with more experienced teachers being more adept at identifying the breaches. 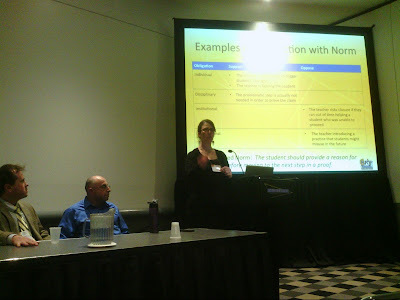 Using similar tools, the group also looked at teachers' preferences toward different student strategies, evidence for hypothesized instructional norms, and different kinds of professional obligations. The group found that when a norm was breached, teachers' justifications for the breach could be categorized as: (a) disciplinary, (b) institutional, (c) individual, or (d) interpersonal. The group considered these categories as part of the collective knowledge of the teaching profession, even though teachers' obligations may not be indicative of personal acceptance. +Karl Kosko dug into some of the measurement of decision making. Teachers were provided scenarios of teaching geometry that ended at key points, followed by four potential actions designed to assess the likelihood of norm compliance. Using multinomial regression, the group found that teachers' pedagogical content knowledge for geometry didn't have any measurable effect on decision making in this study, but years of experience and perceived autonomy did have an effect. In the conclusion, Dan Chazan hoped that work such as this will move teaching practice away from being perceived as an independent variable that determines student achievement. Instead, teaching will be an "achievement verb," something that is dependent on a host of input variables that shape teaching practice.